For those who have never been to the Iowa State Fair, I thought I would post a bit a visual guide of some the tastes and sights to be explored at the fair as well as cover two very cool restaurants to stop by while you're in the Des Moines area. 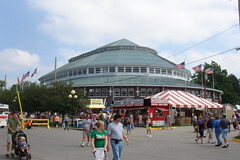 The Iowa State Fair is one of the largest and most popular fairs in the world. The fair attracts upwards of a million visitors during it's 11-day run. During this time nearly 200 food stands serve almost every kind of food you can fry and/or put on a stick. Don't believe me? At last count there were over 20 different kinds of food being served on a stick including corn dogs, cheese, pickles, honey, candy bars and of course pork chops. Being Iowa, the pork chops are a fan favorite at the fair, gobbling down 5-6,000 chops daily. 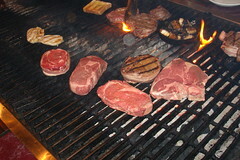 Besides the prepared food, it's also very interesting to see all of the unprepared food with the hooves still on them. I enjoyed seeing all of the technology and work put into the agricultural industry that so many of us take for granted. And I would be remiss if I failed to mention the butter cow. A 550 pound block of butter sculpted into a life size sculpture of a dairy cow. All of these things make the Iowa State Fair a prized foodie badge that's hard earned with almost 240 acres to explore. Tiring, but well worth it. Because of the size of the fair grounds, I recommend arriving early and staying late, or splitting your visit into 2 or more days. The population of Des Moines swells each weekend during the fair, so I highly recommend planning in advance and booking your hotel room in January to get the best deals. If you do stay for a bit, you're going to want to visit some of the local dining options you won't find anywhere else. To help you with that, I'm going to share two of my favorites so far. The first is The Machine Shed. Think Cracker Barrel, but better. The front entry is very similar to Cracker Barrel with knick-knacks and crap galore to sell you while you wait, but with an Iowan agriculture theme. You find jams and honey to pink John Deere trucker hats to coffee table books featuring black-and-white photographs of rustic barns. Once seated, you'll notice the wait staff are dressed like picnic tables in denim overalls and the decor is basically old farm signs and equipment nailed to the wall. All a little funny, but somewhat charming at the same time. The food, however, is just plain good. Every table is given some unusual starters: banana bread, coleslaw and cottage cheese. A little strange, but it's not unlike what I would expect to find at my grandma's house when I was little. The menu is almost exactly what one would expect with some more upscale touches thrown in here and there. 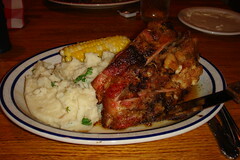 Top quality pork is featured heavily and prepared in tender mouth watering succulent ways. Yep, it's that good. Far better than one should expect for the setting and prices. A must stop place for any city slicker.